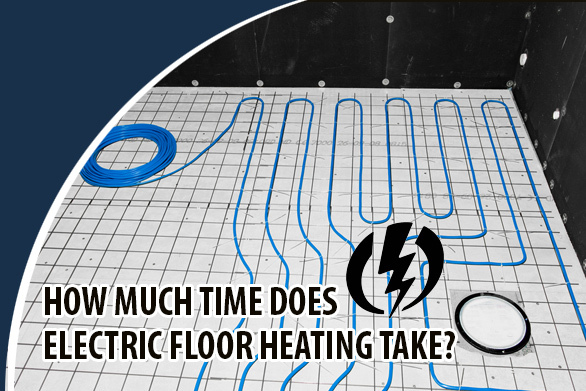 How Much Time Does Electric Floor Heating Take? If you’re planning a bathroom reno, you’ll be considering heating options. We all know how chilly this small room can get in winter, especially in older homes. If you’re fed up of having cold feet, electric floor heating is an affordable option you might want to investigate. There are several types of electric floor heating, also known as radiant floor heating. Some of the most efficient are mats and cables which are installed under your bathroom floors. The heat radiates up through the floor, which is great for chilly toes! Electric floor heating is safe, as there are no exposed elements as with other types of heating. Examples of electric floor heating include Deviamat, which is a 2.5 mm thick mat made in pre-fabricated sizes from 0.5 square metres up to 10 square metres. The In Screed cable system is another option, which is a 6mm thick cable attached to a mesh. These types of electric floor heating can be installed under tiles, stone, and carpet floors. Insulation should be installed beneath the mats or mesh, of course, to prevent heat from being lost down into the ground. Insulation also improves the efficiency of any heating solution, as well as helping you save money. How long does electric floor heating take to warm up? The Deviamat and In Screed cable systems can be programmed with a programmable thermostat for maximum energy efficiency, so they are warm when you need them. The time it takes to heat up depends on your floor, subfloor, and insulation. But as a rough guide, tile floors on insulated plywood subfloors takes about 20 minutes to heat. You could also consider installing similar electric heating devices on the wall behind your bathroom mirror, to prevent the mirror steaming up. Would I save money on electric floor heating? Electric floor heating is energy efficient, reducing your utility bills and your carbon footprint. Radiant heat is one of the most efficient types of heating, as there is no wastage. The floor will stay warm for a while after the power is off, too. It’s essential you use a programmable thermostat, and don’t waste electricity heating floors you won’t be in when you’re at work.